More than just a flip phone, the Samsung P400 swivels a full 360 degrees and included a great-quality CCD digital camera. 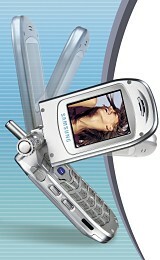 Also featuring 65,000 colours, GPRS and MMS, the Samsung P400 is yet another innovative Samsung mobile. The Samsung P400 features a 2X digital zoom and advanced imaging functions, making the Samsung P400 one of the best camera phones around.